Finding a seat at the library is quite the challenge on this Monday evening. Laptops, books, notes and cups of coffee fill the tables on all levels. Students appear to be tired and overwhelmed as this semester is quickly coming to a close. All computers are occupied and all study rooms are booked. Exactly one week before the final exam period begins, students are spending hours of their day trying to meet the upcoming deadlines. 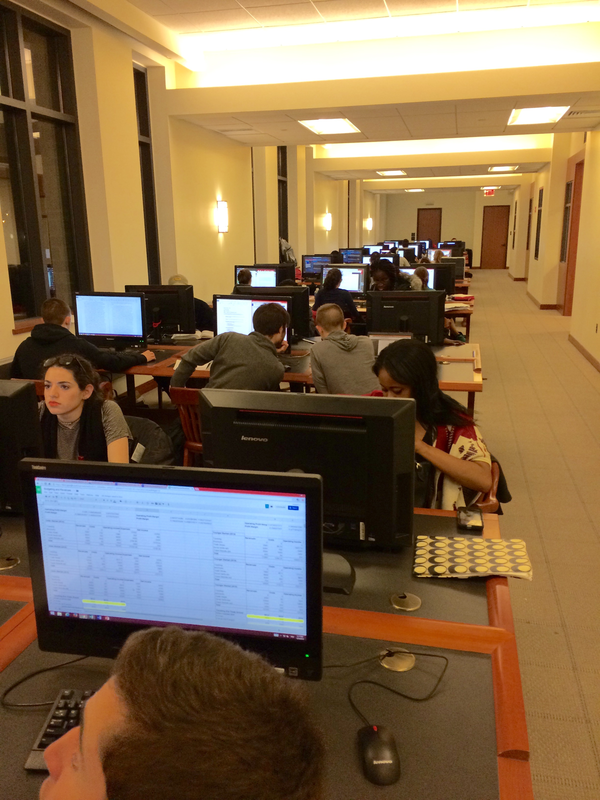 Students working diligently in the Library. In the lobby, Amanda Hickey was conversing was a group of students. “We are working on our group project for our sociology final presentation,” said Amanda. Most projects that students are currently working on have due dates at the end of this week or early next week. With the large crowd that the library attracts at this time many students find it difficult to focus. “I’ve been trying to work on a lesson plan that is due Thursday, but cannot concentrate with all the traffic here,” said Anna Horrigan.